Tim Drake is pondering recent events and their impact on the team as the Titans are quietly sharing a limo ride. Cue our favorite young speedster Kid Flash, acting very Impulse-like by literally running circles around the limo while it is in motion! Bart has also taken a quick side-trip and discovered that their HQ is empty, but Tim explains the reason…they have a new, floating headquarters on a yacht so large that only someone with Wayne-like dollars could afford it! Tim gives a tour of the yacht, and the team settles in to their new rooms. Miguel and Bart share one room and a rather heartwarming conversation. 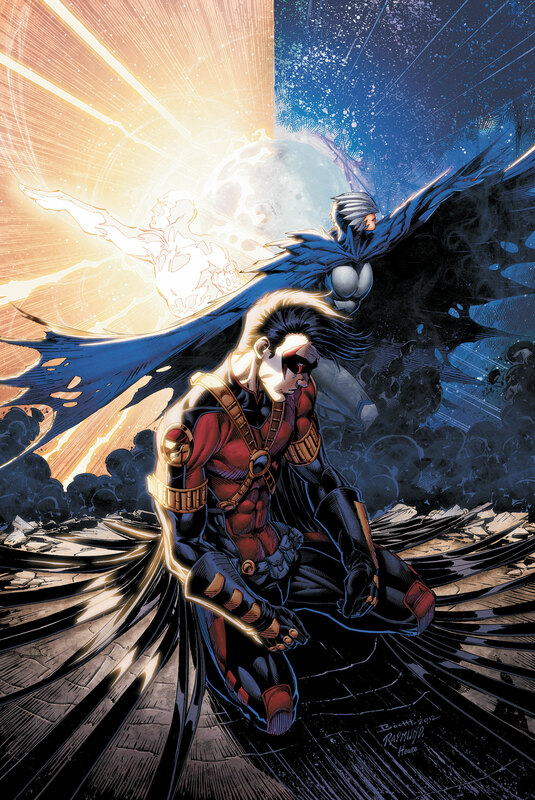 Tim, however, seems to be taking the opportunity to turn into a player…well out of character for Red Robin. He ends up sharing a kiss with both Kiran and Cassie, setting up what will likely be some very difficult situations in future issues. Raven is somehow aware of all of this…but she is interrupted by news that her father Trigon is ready to put his own plans into motion. During all of this, there is a deadly attack at a local coffee shop. Tim is monitoring this from the yacht with an expression that can only be described…if you read the issue (you didn’t really think I’d give away the twist ending here, did you?). The script for Teen Titans #17 comes from Scott Lobdell and Fabian Nicieza, with pencils and inks by Eddy Barrows and Eber Ferriera, and colors by Alex Sinclair. The artwork is excellent throughout, with excellent use of lighting effects that truly make you feel you are in the limo and on the yacht with the Titans, and fully in the scene with Raven as well. The script sets out a lot of threads in this issue – and I mean a LOT of threads, so it can be a bit difficult to follow at times. However, this may well prove to be an excellent jumping-on point for new Titans readers. As these threads are explored in future issues we may well be thumbing back through this issue to see where they all began. SUMMARY: This issue of Teen Titans takes a step back after the high-energy “Death of the Family” tie-ins, and sets up storylines that will have an impact on the Titans for a long time to come. This may well prove to be a great jumping-on point for new readers. I have to admit, I was disapointed that the new HQ was a yacht and not Titans Tower. If there’s anything I dislike more than primates its The Joker. Especially this new, even more macabre Joker; so have been steering well away from anything Bat related these past months. From the look of the last covers on CBR….still going to give these a wide berth. His DC Universe Presents issue was pretty great. If by chance you haven’t had a look at that, I highly recommend it.